A brief history of Reiki and the important people , the founder Mikao Usui. Hawayo Takata - founder of Usui Shiki Ryoho and Dr Hayashi. Current lineage bearer of Usui Shiki Ryoho Phyllis Lei Furumoto successor to Mrs Takata. Japanese branches e.g. Komyo Reiki Kai, Jikiden Reiki and.Gendai Reiki. Important aspects of Reiki are discussed for example Reiki Alliance and Usui’s Memorial Stone in Tokyo. There has been a lot written about the history of Reiki, Usui Shiki Ryoho and its offshoots over the years. Below is an outline of the main people and events to help you gain a basic understanding. Unfortunately some of the early information that was written about Reiki was unclear and at times inaccurate. With continuing research recently, knowledge of the history has improved. The founder of Usui Shiki Ryoho or The Usui System of Natural healing is a Japanese man called Mikao Usui. Much of the information we have about Usui Sensei is from his memorial stone. This was written posthumously and in keeping with tradition always describes the person is best possible terms. It is said that he was born into the privileged class of "hatamoto samurai, a high level of Samurai. According to his memorial stone he was well travelled and well read. He married and he and his wife had two children. In March 1922 he went to Kurama Yama and completed a 21 day strict fasting and meditation practice. Kurama Yama was builkt in 770 AD and is located 30 minutes outside of Kyoto, this mountain has a number of Buddhist temples and also some Shinto Shrines. "One day he climbed Kurama Yama and after 21 days of a severe discipline without eating he felt one great Reiki over his head and attained enlightenment and he obtained Reiki Ryoho. Then he tried it on himself and experimented on his family members. The efficacy was immediate." Usui then set about giving people Usui Reiki Ryoho, he set up the Usui Reiki Ryoho Gakkai (Gakkai is a learning facility) where students would meet. This organisation stills exists today although membership is limited and their activities are closely guarded. Usui sensei taught 21 of his students to Master level. This memorial was erected by the Usui Reiki Ryoho Gakkai in 1927, one year after his death. The memorial stone is located at the Saihoji temple in Tokyo. The temple is a Pure Land Buddhist ( Jodo Shu) temple. It is a three metre stone monument with an inscription honouring Usui Sensei's life. Is located about 16 kilometres north of Kyoto. The Mt Kurama temple is said to be a place of transformation and introspection. Many powerful figures in Japanese history have taken spiritual refuge on Mt Kurama over the years. Hayashi was a retired naval captain and medic. He began studying with Usui in 1925. Usui requested that Hayashi set up his own dojo (training centre) and develop the healing aspects of Reiki practice. This fact may have saved Reiki from being lost at that time. To be able to treat patients in public you had to be an acupuncturist, medical person or massage therapist, therefore Hayashi was able to continue Usui's work. He set up a clinic in Tokyo to give people Reiki Ryoho. In this clinic people were treated on a massage table and usually by 2 practitioners. We attribute the introduction of the "standard Reiki positions" to Hayashi. Hayashi taught 15 Reiki masters. Mrs Takata was born on the island of Kauai on Hawaii to Japanese parents. Her husband died in 1930 leaving her to bring up their two daughters on her own. Her health suffered under this strain and then after a death in the family she travelled to Japan to inform her family of this sad event. She sought treatment for her ailments, including an abdominal tumour and eventually went to Hayashi's clinic in Tokyo. After receiving daily treatments for three weeks her health was restored. Mrs Takata was keen to undertake training in this Reiki Ryoho. This required some careful negotiation as she was not a Japanese national and as a woman unable to ask Hayashi directly. Eventually Hayashi agreed and she undertook Reiki Ryoho training with him. This training involved working in his clinic every morning, attending house calls in the afternoon and a review of the day in the evening. Mrs Takata returned to Hawaii in 1937, Hayashi and his daughter travelled there to assist Takata set up her clinic later that year. When Hayashi left Hawaii in 1938 he announced that Mrs Takata was a fully accredited Reiki Master. 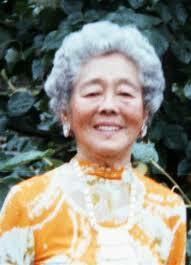 Mrs Takata practised mainly in Hawaii with occasional trips to mainland US. In 1973 she was invited to teach in British Columbia, she spent most of her last 7 years teaching Reiki Ryoho. Mrs Takata taught 22 Reiki Masters. Click here to see Details of Mrs Takata's 22 Reiki Masters. Today it has been estimated by Reiki researchers that 90% of people who have learnt Reiki have been taught in a style derived from Hawayo Takata. Within 15 years of Mrs Takata's passing Reiki Ryoho had spread throughout the world via the teaching and training of her 22 Reiki Masters. Reiki had continued to be taught in Japan by Usui and Hayashi's masters but they did not offer Reiki outside Japan. As Pamela Miles says in her book "Takata was a woman of pragmatic vision. She knew Reiki could not be transplanted wholesale from one culture to another, and that, with watchful combination of steadiness and flexibility, Reiki would develop in a meaningful way in a new culture. Thanks to her foresight and courage, Reiki is thriving globally..." ( Miles, 2008). A year after Takata's passing all but 1 of the Masters she trained met to discuss the future and share their experiences. From this initial meeting the Reiki Alliance was born, this is an international group of Reiki Masters trained in the traditional Takata style. Mrs Takata taught Reiki as an oral tradition and did not give out manuals/notes to her students. The Reiki Alliance continues to this day some 37 year later with worldwide membership that meet annually. They work to hold the integrity of this tradition and develop personally and collectively with Reiki. The members decided that Mrs Takata's grand daughter, Phyllis Lei Furomoto would be the spiritual lineage bearer. Gendai, Komyo Reiki Do and Jikiden Syles of Reiki. The founder is Hiroshi Doi, a Japanese man who first learnt Shoden in 1993. Doi sensei states that Gendai is "A practical Reiki method for modern people". He started teaching this style in 1998, it is a hybridisation Doi developed from Western and Japanese Reiki methods. The Attunement/initiation process is one that Doi created himself. The founder is a lay Buddist priest named Hyakuten Inamoto. Inamoto sensei developed his style in 1998 after training from Mrs Yamaguchi ( see Jikiden below) .Inamoto sensei states in his Shinpiden manual; "Komyo reiki is a Hayashi shiki (style) Usui Reiki Ryoho... is a keep it simple Reiki system... the teaching method is basically by word of mouth" The motto is "Place your hands, Surrender and Smile". ( Komyo Reiki Kai Shinpiden Manual 2012). Deacon considers this style to have components of Gendai, Rand syle Reiki ( itself a blend) as well as information received from Chiyoko Yamaguchi. Founders; Chiyoko Yamaguchi and Tadao Yamaguchi (her son). Tadao started teaching his style seminars in 1999. Jikiden means "directly transmitted or passed down from ones teacher". The founders say that their aim is to bring the teachings of Hayashi to their students. Chiyoko was taught Shoden( level 1) and Okuden ( level 2 ) by Hayashi, she was taught Shinpiden by her Uncle Mr Wasaburo Sugano.